No longer guided by zero-sum calculations or outdated ideologies, can India befriend both rivals? New Delhi’s diplomatic prowess was once again on display recently with Palestinian President Mahmoud Abbas in India for a state visit, the fourth of its kind since 2005. New Delhi pledged its full support for yet another Palestinian bid for UN membership, announced a $10 million contribution to Palestinian coffers, and inked three pacts aimed at increasing cooperation in a number of diverse areas. While New Delhi’s close ties with the Palestinians date as far back as the pre-partition era, the last two decades have witnessed India embark on a strategic partnership with Israel after nearly four decades of diplomatic estrangement. Contradictory on their surface, New Delhi’s strong bilateral relationships with the Israelis and Palestinians serve a host of important Indian interests. India’s ability to advance those interests by balancing its traditional support for the Palestinians with its rapidly burgeoning relationship with Israel demonstrates the extent to which Indian foreign policy has evolved over the past two decades in favor of a more pragmatic approach to its foreign affairs. India’s balancing act between its Israeli and Palestinian friends is a relatively recent phenomenon. For most of its pre and post-independence history, New Delhi viewed the Israeli-Palestinian conflict through an ideological lens and in zero-sum terms, pursuing a foreign policy antagonistic towards the Jewish state. In fact, India refused to grant Israel full diplomatic recognition until 1992, the last major non-Muslim country to do so. Such hostility towards Israel is surprising given the similarities the two countries share. Both nations are former members of the British colonial system, are surrounded by traditionally hostile states, are islands of democracy in the middle of generally undemocratic regions, and are constant victims of Islamic extremism. Despite these similarities, New Delhi maintained an unsympathetic posture towards Israel from its earliest days. Several factors, including a fear of alienating its large Muslim population, Cold War politics, a desire to counter Pakistan’s influence in the Muslim world, and a need to garner Arab support for its position over the Kashmir issue compelled New Delhi to pursue an exclusively pro-Arab and thus pro-Palestinian foreign policy for more than forty years. Such a policy translated into India reflexively condemning Jewish aspirations in Palestine and later the Jewish state itself while instinctively supporting the Palestinian position. 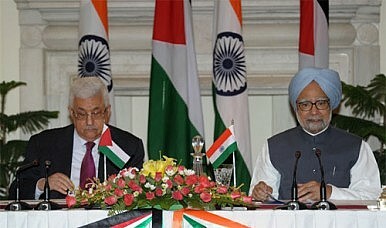 After more than four decades of such policy imbalance, however, a host of developments, notably the end of Cold War, exposed the discredited and anachronistic assumptions underlying India’s Middle East policy, and forced New Delhi to recalibrate its approach towards the region to reflect new international realities. India’s cherished Non-Aligned Movement (NAM) lost its validity following the end of the Cold War and with it, New Delhi’s ideological justification for its staunchly pro-Palestinian and anti-Israeli position. Additionally, the 1991 Madrid Peace Process prompted India to conclude that if the Arab world and the Palestinian Liberation Organization (PLO) were now willing to negotiate with Israel, New Delhi had no reason to maintain the status quo. India also realized by this time that its longstanding and unqualified support for the Palestinians had reaped few, if any, dividends for New Delhi over the Kashmir issue or any other dispute involving Pakistan for that matter. Abandoning ideology for pragmatism and zero-sum calculations for a more fair balanced approach, India finally extended full diplomatic recognition to Israel in 1992. Ties between the two countries have flourished since then with India and Israel sharing a congruence of interests in several areas and embarking on a multidimensional “strategic partnership” as a result. The two natural allies have made counterterrorism and military cooperation the centerpiece of their bilateral relations, which is unsurprising considering both countries share similar strategic outlooks and face constant assault from Islamic terrorism. New Delhi has benefited from Israel’s expertise in counterterrorism training and border security, while Israel has emerged as one of India’s most important sources of sophisticated military equipment and weapons systems. Economic cooperation as well as collaboration in space research, trade, science and technology, and education are also thriving between India and Israel. Although India’s dynamic relationship with Israel advances a series of critically important Indian interests, New Delhi has not allowed its robust ties with the Jewish state to dilute its historic bonds with the Palestinian people. On the contrary, New Delhi recognizes the domestic importance of maintaining those bonds and calculates that its unwavering support for the Palestinians allows it burnish India’s secular credentials abroad and retain influence and credibility in the Arab world, two important Indian foreign policy objectives. Similarly, New Delhi has continued to deepen its relations with Israel while simultaneously showcasing its ties to the Palestinians, deftly pursuing both bilateral relationships in tandem. That neither side sees any inconsistency in India doing so is a testament to New Delhi’s newfound diplomatic dexterity. India’s skillful balancing act between its Israeli and Palestinian counterparts is an enlightening illustration of the transformation Indian foreign policy has experienced since the end of the Cold War. Although India has not entirely jettisoned some of its outdated instincts that previously shaped its approach to the region, it is no longer guided by zero-sum calculations or held hostage by outdated ideologies. Whether India can sustain the success it has achieved is yet to be seen, but so far, India’s new foreign policy calculus towards the Middle East is a welcome departure from decades past. Ronak D. Desai is a fellow at the Truman National Security Project.